Print Director tracks Windows print servers on an Ethernet network. WAN networks are supported and the software can operate in Offline Mode (i.e. if the connection to the central database is lost, they will write transactions to a local MS Access DB). Currently Unix, Linux and Macintosh print servers are not supported. However, printouts from client machines using these OS’s to Windows print servers will be tracked. Note the minimum requirements in Appendix 1. The Print Director database (PDDB2) is supported on Microsoft SQL Server 2005 – 2017 on both full and Express editions. Some sites may have an existing SQL Server that is used for other applications. It may be more beneficial to run PDDB2 on this server since it may be optimised for database services and have backup procedures already in place. Enquire with the system administrator whether the PDDB2 may be installed on this server and obtain an SQL Server Authentication username and password (ensure that the server supports Mixed Mode Authentication as required by Print Director). If there is no existing SQL Server a machine must be allocated for an SQL Express installation. This could be the primary print server or any other machine. In the unlikely event that no PCL or Postscript driver is available for a particular printer, notify the reseller and confirm whether the current printer language is supported. If the site requires photocopier tracking, submit the device models to the reseller for confirmation of support by the controller terminals. Spooled print servers: A print server that has a number of shared printers set up. Clients then connect to these printer shares to print. Desktop print servers: Workstations that have a desktop inkjet or laser printer connected to the LPT or USB port. Direct-to-IP printing: Workstations that print directly to network connected printers. If the site is to make use of photocopier tracking or Secure Document Release/Follow Me functionality, ensure that the printers support the embedded Print Director module. Normally only one PDServer is required on a network. This is the module that communicates with the embedded software on the printers, and executes scheduled tasks (e.g. report emails and Active Directory Synchronisation). There are cases however, where more than one PDServer is required. An example would be a client that has multiple sites connecting to a central database over a WAN. It would be advisable to install a PDServer at each site. If the WAN were to go down, users would still be able to log into the printers, as the local PDServer would continue operating in ‘offline mode’. They have any local direct-to-IP or USB print queues. They will perform popup account billing. They require popup user authentication. They require popup Rule violation notifications. These machines must meet the minimum requirements (see Appendix 1). A reboot is not required and the installation can be pushed via Group Policy or a similar deployment system (e.g. Microsoft Systems Management Server – SMS). Administrators that conduct tasks such as altering printout pricing and adding users and accounts will require the Resource Manager module. Ensure that their workstations meet the minimum requirements (see Appendix 1). No reboot is required. Administrators that generate reports require the PDReports module. Confirm that these machines adhere to the minimum requirements (see Appendix 1). No reboot is required. If a site only requires a few software modules to be installed, it would most likely be more efficient to manually install at each machine. An example of such a site would be one with a few print servers and users that do not require the popup client. Sites that require many software modules to be installed may need to make use of a remote deployment strategy. Remote deployment is possible in sites that require all machines and users to log on to an Active Directory domain controller. Group Policy objects can be configured in the Active Directory that governs the deployment of packages to specific machines. An example of such a site would be one with many workstations that all print directly to the IP of the printers. The PDAgent module can be remotely deployed to all these workstations. Another example is a site with all their users making use of popup account billing (to perform third-party account billing). The system administrator would need to be informed of the port requirements for Print Director. See Appendix 1 for details. Note that if Windows Firewall is used, the PDAgent modules automatically create an exception for themselves. Ensure that all of the following steps are performed in advance of the scheduled implementation (e.g. 1 week). This is especially relevant in sites that will use remote deployment (Group Policy / SMS). Database machine: If SQL Express is to be installed (i.e. the site does not already have an SQL Server), obtain an administrative username and password for the database machine. Manual deployment on each machine: Administrative access rights are required for the installation of all modules. Remote deployment via Active Directory: Sufficient access rights to edit Group Policy Objects will be required. The PDAgent module will automatically add an exception for itself in Windows Firewall. When the client application for PDAgent starts up, Windows Firewall should display a window asking whether or not to unblock it. If any third-party firewalls exist on site, they should be configured to open the required ports (see Appendix 1 for port numbers). The installation of SQL Express should automatically add the required Windows Firewall exceptions if the Print Director installer is used. If SQL Express is installed independently, a firewall exception must be added for the sqlsvr.exe and sqlbrowser.exe processes manually. Execute PrintDirector.EXE from the installation CD folder. The first form will be the end-user licence agreement. Please read the agreement carefully and if accepted, tick the I accept the terms of the licence agreement checkbox and click Next. The next form will allow you to choose which modules to install. Install only the packages required for the local machine. If all packages are required, leave all the checkboxes selected. If the Install SQL Server Express option is selected, the installation settings form will be displayed after clicking Next. 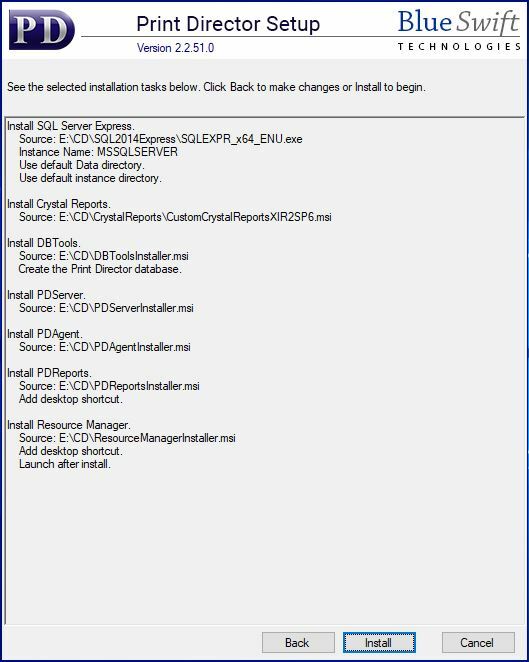 This will default to the SQL 2014 Express installer that is normally contained on the Print Director CD. However, if you would like to install a new version SQL Express, you can change the path to the installer by clicking the button. Use a password that meets the policy requirements for the domain. It is recommended to use the standard password for the distributor. Please contact Blue Swift to find out what this should be. If the password doesn’t meet the domain requirements, ask the system administrator for a strong password recommendation. If there is no existing default instance of SQL Server (check services.msc for SQL Server (MSSQLSERVER)) change the option to Default instance. 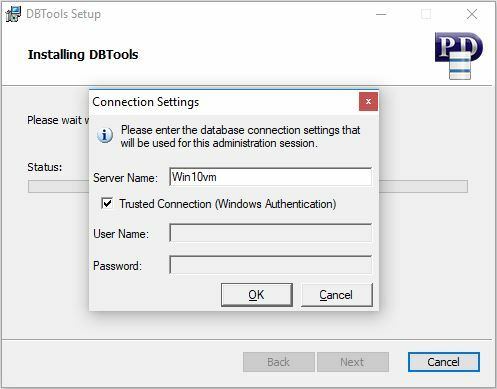 Using the default instance means that the SQL Browser service is not required, and you don’t need to specify the instance name when entering database connection settings for other module installations. Use the named instance ‘PD’ if there is an existing default instance of SQL Server that we can’t use for the PDDB2 database. Accept the default data paths unless the system administrator requires them to be changed and click Next. Check the summary of installation tasks. Click Back to make changes or Next to begin the installation. During the DBTools installation, the Print Director database can be created if the checkbox was selected on the initial screen. Enter the name of the SQL Server in the Server Name text box. If the server has a default instance of SQL Server then the server name is the same as the hostname of the database machine. If it has a named instance then the server name is MachineName\InstanceName (e.g. PDSERVER\PD). Leave the Trusted Connection check box ticked unless the server is on another machine on which the current logged-in user does not have sufficient access rights. A Create Database popup will ask you if you are sure you would like to create the database, click Yes. A form will be displayed showing the default data and log file path for the new database. This is the default data path for the specified SQL Server. Do not change this path unless instructed to do so by the system administrator. After the database has been created, a message will be displayed asking if a licence file should be submitted. Choose Yes. Type in the 12-digit code and click OK.
Once the licence is submitted, the rest of the installation will continue. The Resource Manager window will be displayed at the end of the installation if it was configured to do so on the initial form. If modules are installed on machines other than the machine on which the database was created, the database settings will need to be configured. The form below will be displayed on startup of Resource Manager or PD Reports. In the case of an installation of PDAgent, the form will be displayed after the install wizard completes. The server name is the machine name on which the SQL Server is running. If it is a named instance it will be MachineName\InstanceName (e.g. PDSERVER\PD). The username PDUser (password is PDUser) is filled in by default. This user account is created with the Print Director database. Accept these defaults unless specifically instructed not to by the system administrator. In the menu bar, click Tools > Add database settings to msi file. A browse dialogue will appear. Locate the PDAgentInstaller.msi file and click Open. This is a shared folder on a server to which all users have ‘read’ access rights. It may be a good idea to add the ‘Domain Computers’ security group to the list of allowed ‘read’ objects. This is because it is actually the computer accounts that will be executing the installation. Copy the SetupPDAgent.msi file into this folder. In the menu bar, click Tools > Group Policy Management. In the New GPO window, enter a name (e.g. PDAgent install). Now that the GPO has been created, the node will appear below the container. Right click this node and choose Edit… and the Group Policy Management Editor window will open. Under the Computer Configuration node, navigate to Policies > Software Settings > Software installation. Double click the shared folder and select the PDAgentInstaller.msi file. The next window should be the Deploy Software window. Leave the option Assigned selected and click OK.
Our software installation package should now appear in the list. When the client workstations are next rebooted, they will install the PDAgent automatically and connect to the database (as long as the Computer Objects are contained within the container to which the GPO is linked). Print Director supports all versions of Microsoft SQL Server from 2005 to 2017. Express versions are fully supported. Please consult the Microsoft literature for the minimum requirements. The minimum and recommended requirements listed below are expressed with the assumption that the server will not be running any other services (e.g. domain controller, Exchange, etc). Should the server be running other services, the specifications below should be adjusted accordingly. PDServer, Resource Manager: All Windows desktop operating systems from Vista upwards. All Windows Server operating systems from Server 2008 upwards. PDAgent, PDReports, DBTools: All Windows desktop operating systems from XP upwards. All Windows Server operating systems from Server 2003 upwards. PDServer, Resource Manager: .Net Framework 4.5 and above. PDAgent, PDReports, DBTools: .Net Framework 3.5 and above. The Print Director modules installed on a Print Server will use approximately 200MB of hard drive space. More importantly, the size of the hard drive on which the spool folder is hosted must be correctly allocated. Print Director holds the spool files for MFPs running in Secure Document Release mode on the server. Under this mode, the user must release their jobs at the device. Until the jobs are released, these spool files will be using space on the server hard drive. An auto-delete timeout can be set to limit the amount of time the jobs wait at the server. Monitors the print queues for the MFPs and printers. Prevents print jobs from exiting the queues (i.e. no changes to the port configuration or print processor are made). Waits for communication from PDServer before releasing the jobs (i.e. user logs in and selects the jobs for release). Required to be installed on the print server. Multiple PDAgents can be installed on multiple print servers and connected to the same DB. Connects to the SQL Server via ADO.Net. Can operate in Offline mode (i.e. if the SQL Server connection is lost it caches transactions to a local MS Access DB). Can be installed on a single server or multiple servers (multiple servers to prevent MFP authentication requests from going over unreliable WAN links). Performs communication with the embedded applications on the MFPs (Authentication and PullPrint). Executes scheduled tasks (e.g. report emailing and active directory synchronisation). Does not necessarily have to be installed on the print server. It communicates with PDAgent (to receive waiting job subscriptions and forward job release commands) via TCP/IP. Configuration module for print director. Used to maintain user PIN numbers. Used to maintain printer definitions and IP addresses. Used to install the embedded applications to the MFPs. Can be installed on multiple workstations and connected to the database. Reporting module for Print Director. Backup and restore of the DB. Listens on TCP port 20111 for communication from other Print Director modules. Listens on TCP port 20113 for communication from other Print Director modules. Listens on port 50002/50004 for communication from embedded Konica Minolta MFPs. Listens on port 5114 for communication from keypad attached MFPs. Listens on port 20114 for communication from embedded Lexmark MFPs.